Welcome to the very first Bloom Day at Hayefield! I found out about this event (created by Carol at May Dreams Gardens) just this morning, but I wanted to join the fun, so I managed to grab a few pictures to put together a short post. I hope to be more organized next month. 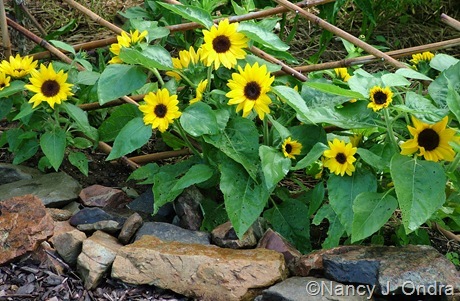 For now, let’s start with a great little annual sunflower (Helianthus annuus) called ‘Sunny Smile’ from Johnny’s Selected Seeds, sown on July 20th and flowering now at about 1 foot tall. The black-leaved cotton (Gossypium herbaceum ‘Nigrum’ or ‘Nigra’) is also just beginning to bloom. We’re supposed to go down to the 40s tonight, though, and these plants seem to hate getting that cold, so this may be the only flower I get for the whole season. Some years, the seedpods form, but our seasons are too short for the seed to ripen. Still, it’s worth growing just for the foliage. Each year I change the foundation-planting strip along my front porch. 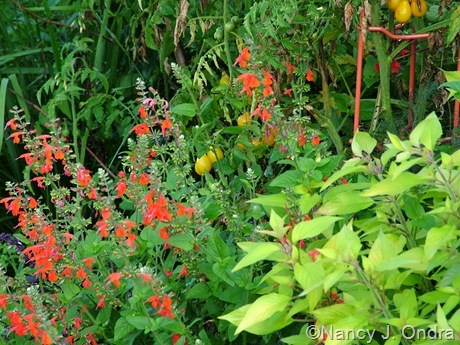 Here’s a vignette from this year’s mostly-edibles collection: a combination of yellow-leaved ‘Golden Delicious’ pineapple sage (Salvia elegans) and scarlet ‘Lady in Red’ sage (S. coccinea), with a few ‘Yellow Pear’ tomatoes in the background. The pineapple sage isn’t even forming buds yet, so I seriously doubt it will flower before frost. With that great foliage, though, it doesn’t really need to anything but sit there and be leafy. 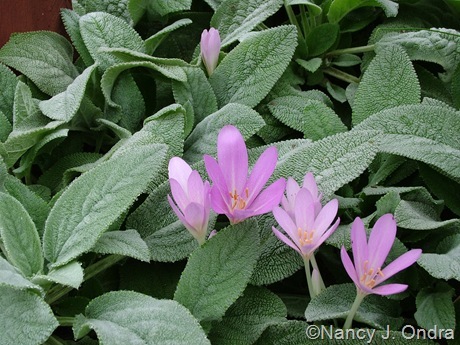 These autumn crocus (Colchicum autumnale) first popped up through some ‘Big Ears’ lamb’s ears (Stachys byzantina) about a week ago and are still looking great. I can’t remember why I planted them here instead of with the regular lamb’s ears, which is much shorter. These blooms had to stretch up a good 9 inches to just peek above the ‘Big Ears’ foliage. At least there’s no chance of the blooms keeling over, as they often do with lower-growing companions. Leucanthemella serotina also first opened about a week ago, about the same time as the bluebeards (Caryopteris x clandonensis). I’m normally not a big fan of white flowers, but I have to make an exception for these. Despite the wind and rain last night, they’re not showing any sign of flopping, which is a big plus, since staking is not high on my spring to-do list. 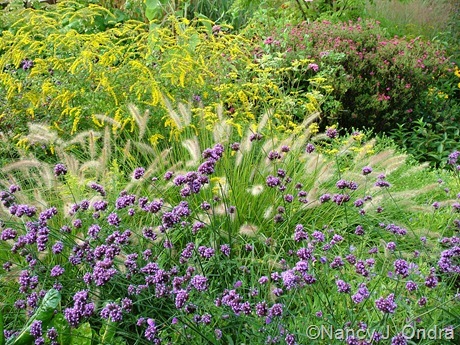 This simple combination features (from front to back) Brazilian vervain (Verbena bonariensis), fountain grass (Pennisetum alopecuroides), ‘Fireworks’ goldenrod (Solidago rugosa), and ‘Alma Potschke’ New England aster (Symphyotrichum novae-angliae). 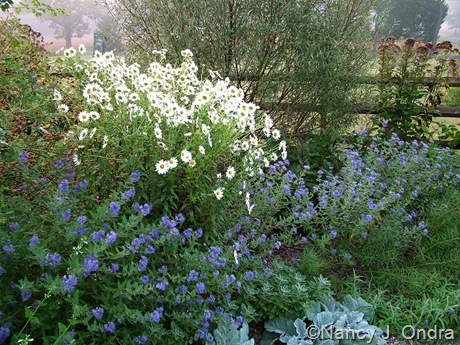 Normally, the vervain would be taller, but these self-sown seedlings came up late this year, so they’re only about 30 inches tall – perfect for the front of this border. That’s it for mid-September at Hayefield. 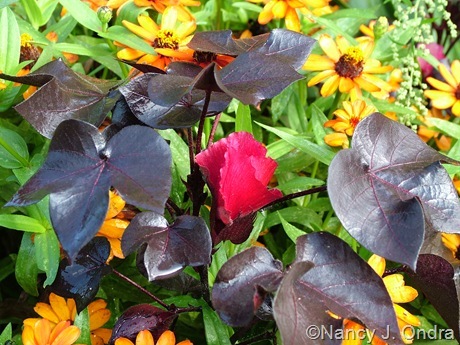 To see what’s popping in other gardens all around the world, visit today’s main Bloom Day post at May Dreams Gardens.